With St. Patty’s Day right around the corner, here is an outrageous idea for a fabulous St. Patrick’s Day party! Let’s do something fun and different, and of course, GREEN for St. Patrick’s Day! Sounds like a chocolate fountain flowing with green chocolate fondue would be just the thing! Set up is easy and your family and friends will remember this as the best St. Patrick’s Day Party ever! Sephra’s Select Fountain is the best home fondue fountain on the market – easy to set up, easy to clean with dishwasher safe parts and SUPER quiet. You cannot even hear it! – Connect the two cylinder pieces. 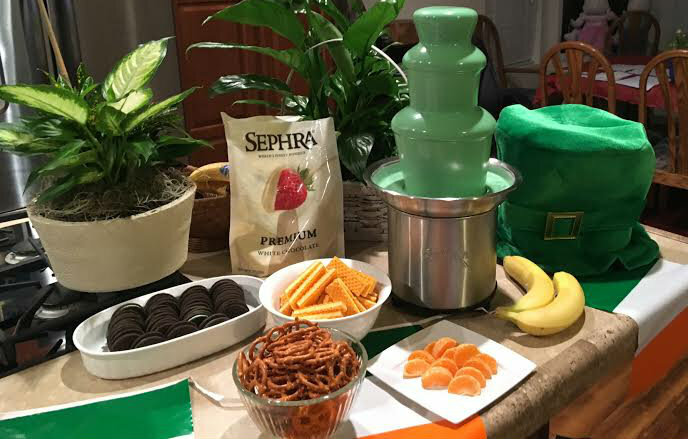 When you are ready to set up your St. Patty’s Day fountain turn on the fountain “heat” button while melting the chocolate. White chocolate is more sensitive than milk or dark chocolate, so take care when melting and stir from the bottom of the basin every 30 minutes or so during your event to keep it from burning. Microwave the chocolate bag for 1:30 at half power. Knead the bag. Do this a couple times until chocolate inside feels melted. Carefully tear open the top of the bag and pour melted chocolate fondue into fountain basin. Complete the same process with second bag of chocolate. Let the chocolate heat in the basin for a few minutes. Stir a bit with a spatula scraping from the bottom of the basin. Turn on the power button to get the chocolate flowing. If it seems lumpy it may need to circulate a few minutes to melt all the chocolate chips. This is a show stopper, so if you feel like waiting for your guests to arrive to do this – it’s kinda fun to watch! Simply take your bottle of Oil Based Chocolate Coloring and slowly add drops to the top of the flowing chocolate. It will take a minute and then your white chocolate will start to turn a minty green. Keep adding drops until you achieve the desired green. Take a small spatula and lightly stir the chocolate in the basin which will still be white, gently coaxing it into the flow. Voila! Green chocolate with an absolutely delicious flavor! I really haven’t met a dipping item I didn’t like with white chocolate… but here are some favorites. 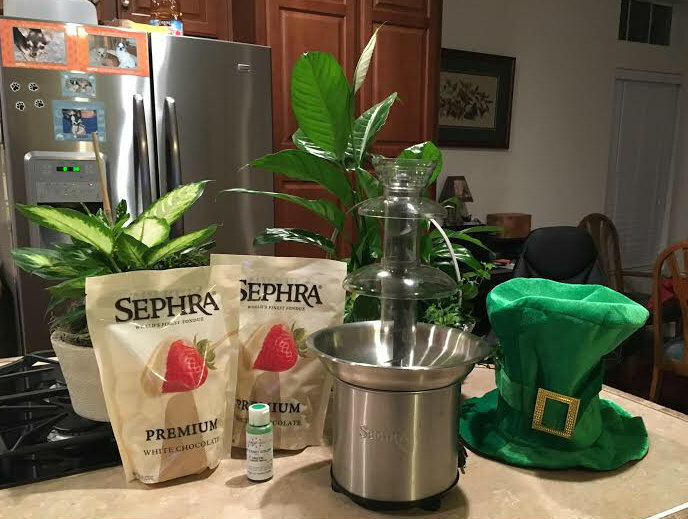 Sephra carries only the top of the line products in everything we do. From our home chocolate fountains and commercial chocolate fountain units to our chocolate fondue and accessories – we have created the best. The Sephra Select Home Fountain is a steal at only $69.99. Made of high quality stainless steel and a whisper quiet motor this little fountain is perfect for any occasion. 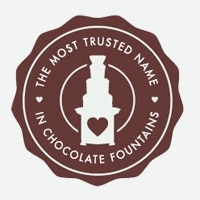 Check out the video done by wiki.ezvid on the 7 Best Chocolate Fountains 2016. Our Select came in at #3. Our Sephra Elite came in #1. For smaller family gatherings and events, the Select is the perfect choice. I use mine more than any other model. 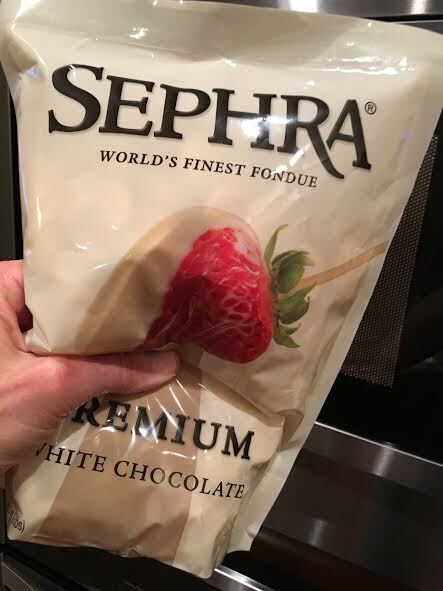 Our Premium Chocolate is so amazingly delicious – I promise you won’t find more delicious chocolate anywhere than Sephra Premium and Belgian fondue chocolate. We were the first to develop this type of couverture chocolate, perfect for use in chocolate fountains – WITHOUT the addition of any oils. Our Chocolate Coloring is especially made for use in chocolate. Don’t use the food coloring you have in your cupboard! Things will not go well. In order to color chocolate you must use an oil based coloring. 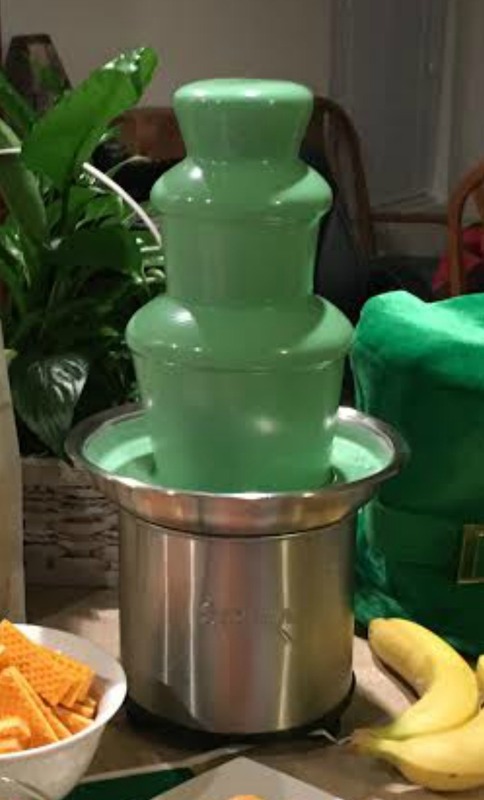 We have so many colors, so get ready to dazzle your guests throughout the year at Easter, Mothers Day, Christmas and of course the Green St. Patty’s Day Fountain. Cheese – taco bar anyone?